See top New York attractions immortalized in movies on this Turner Classic Movies (TCM) bus tour of more than 60 filming locations all over Manhattan. View clips from classic movies featuring famous city landmarks so you can compare how they look today. See Holly Golightly’s apartment in 'Breakfast at Tiffany's,' the subway grate over which Marilyn Monroe stood in 'The Seven-Year Itch' and the dramatic view of the Queensboro Bridge from Woody Allen's 'Manhattan.' Stop for photos at various filming locations and learn more about the rich moviemaking history of New York from your guide, a local actor. Combine Manhattan sightseeing with your love of movies on this Turner Classic Movies (TCM) tour. Meet your guide in Times Square and board your comfortable bus to begin your tour of New York’s most famous film locations. Movie shoots are a common occurrence in this city, and you’ll see the many iconic landmarks and vibrant neighborhoods that make this one of the most filmed cities in the world. Choose to elevate your experience with an upgrade to priority seating. Learn about New York and its famous film locations from your actor guide and answer movie trivia questions. View clips from old movies as you pass their filming locations so you can see how much they have or have not changed. Stop at several locations along your route for closer looks and photo ops. Head uptown and see Columbus Circle, Lincoln Center and Zabar's, the gourmet market featured in You’ve Got Mail. Continue to the Dakota Building, where John Lennon once lived; this stately building on the west side of Central Park was featured in Hannah and Her Sisters and Rosemary's Baby. Cross Central Park, learning about the multitude of movies that have been filmed in this vast and lush urban oasis. Head downtown and see the famous subway grate on the corner of 52nd and Lexington that Marilyn Monroe stood over in The Seven-Year Itch. 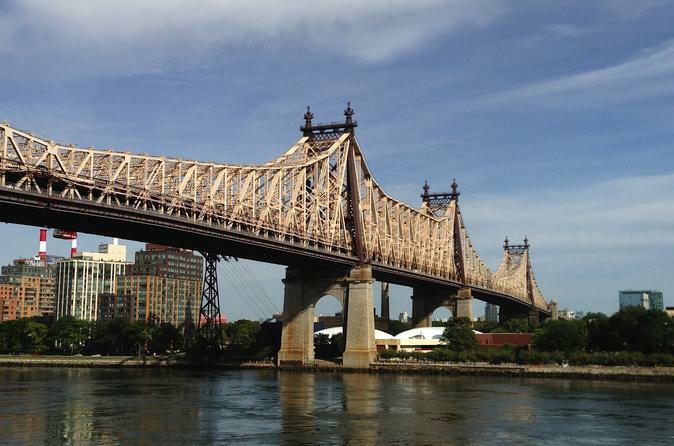 Have a look at Holly Golightly’s apartment in Breakfast at Tiffany's, and go to the lesser-known Sutton Place neighborhood to see the fabulous view of the Queensboro Bridge from Woody Allen's Manhattan. Continue downtown, passing popular filming locations including giant toy store FAO Schwarz; the posh Plaza Hotel; and Rockefeller Center, famous for its wintertime ice rink and Christmas tree. And gaze up at the one and only Empire State Building to see where King Kong clung for dear life! End your 3-hour tour at Grand Central Terminal, the bustling train station featured in countless films including Superman and North by Northwest. From here, it’s easy to go anywhere in the city to continue sightseeing or get back to your hotel.